Well, how time flies when you’re having fun! Apologies for the long absence, I’ve just had the craziest six weeks I can remember, with so much packed in that until now there’s been no time to sit and collect my thoughts. If I tell you that since my last entry I’ve visited three Scottish Castles, the island of Tiree, Callanish on Lewis, Jarlshof on Shetland, Avebury, West Kennet Long Barrow, Bath, Oxford, Leicester, Hay on Wye and Hereford, you’ll begin to get a feel for the dashing about that’s been happening. In between the trips there have been birthdays, school-leaving, three days over in Bedford for the Bedford River Festival, helping at The Workhouse and the occasional frantic loading of the washing machine. And throughout it all, it’s been hot! The best summer for weather since 1976 (and I do remember that summer very well), which has simply put the cherry on the top. It’s been amazing and to be honest I’m only just beginning to slow down long enough to appreciate everything I’ve seen, but I’ll admit to being pretty exhausted too. So here I am now, back with both feet on the ground and looking forward to spending time mentally processing some of the wonderful things I’ve seen and thinking about how I’ll incorporate them into future art pieces. 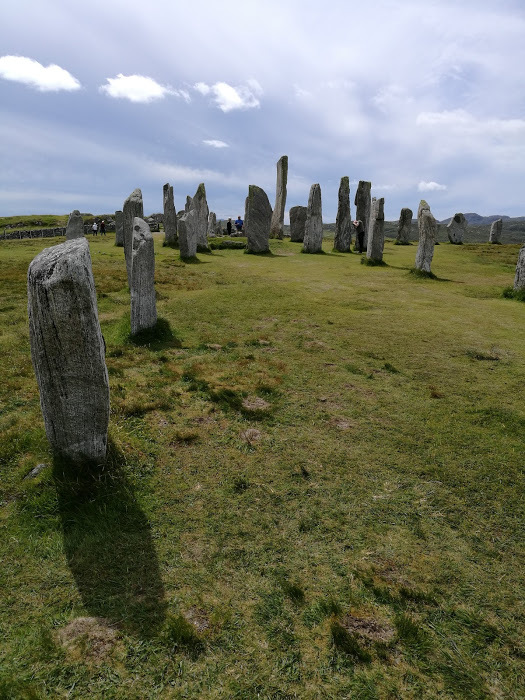 My fascination with stone circles, ditches and ancient earthworks is a fairly recent thing. I suppose there was something tickling the back of my mind, but it's really only been in the last ten years or so that I've fallen under their thrall. 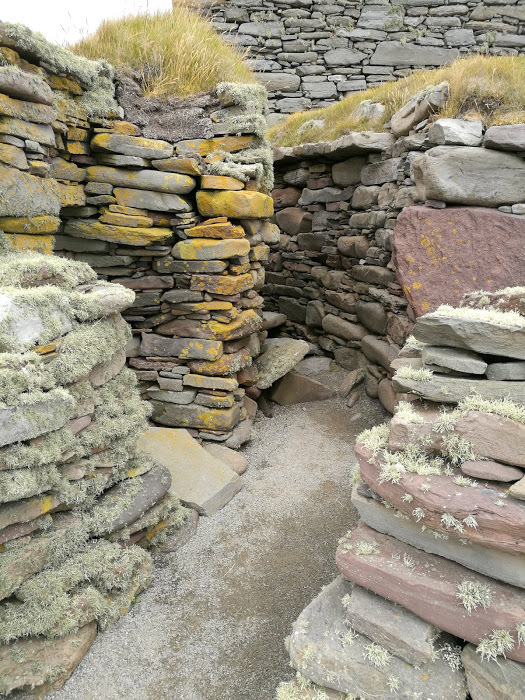 But this year has been the great unfolding for me and I've been so excited to visit sites that are full of mystery, places that speak directly to the imagination. 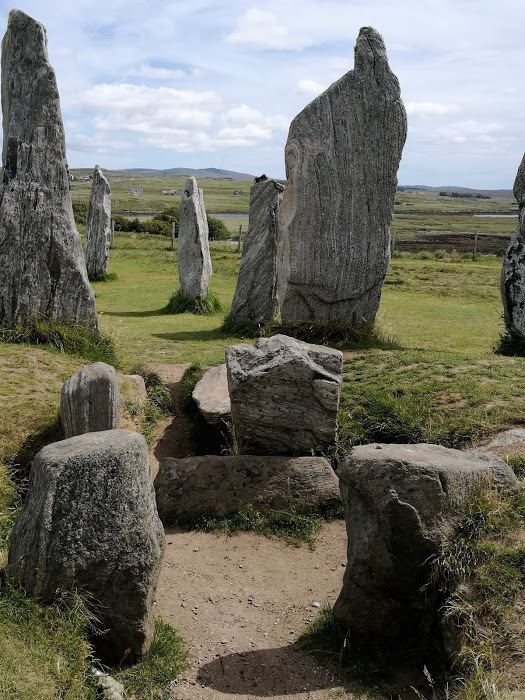 Pictures from this summer's adventures; the Rollrights - Oxfordshire, Callanish - Lewis, Jarlshof - Shetland, Avebury - Wiltshire. The circle was clearly of deep significance to our ancestors, it’s there in the neolithic, bronze and iron ages. It’s significance is something I’m sure you could spend a lifetime considering. 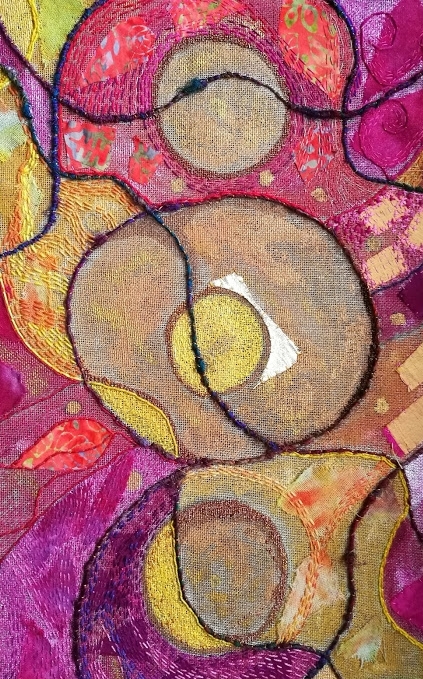 Circles have been finding their way into most of my work for some time now, I couldn’t tell you exactly why, it just seems to be something I need to explore (although I'll also be honest and say that there are more now that I use less needlepoint. Have you ever tried to stitch a circle in tent stitch?). But I do wonder where the human love affair with the circle begins? Once you start to look, they are everywhere. Unsurprisingly, the piece I'm currently working on includes circles - at least three of them. 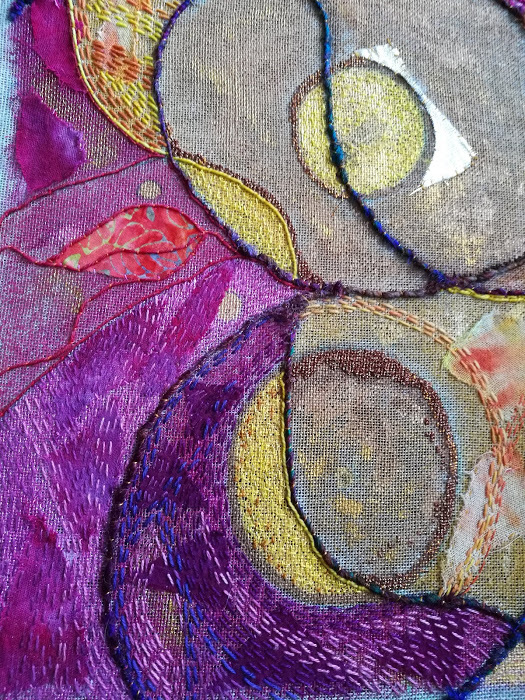 It's still at an early stage - as you can imagine, there hasn't been too much time for stitching recently, but in case you're interested, here are a few close up photos to show how it's developing. The canvas is a linen scrim which I painted with acrylic paint and pens. 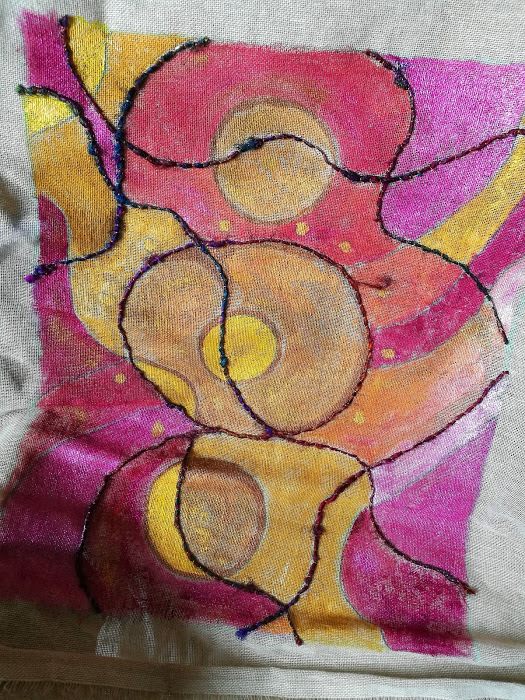 I then attached (glue and stitch) fragments of fabrics and couched sari silk thread to highlight the lines. 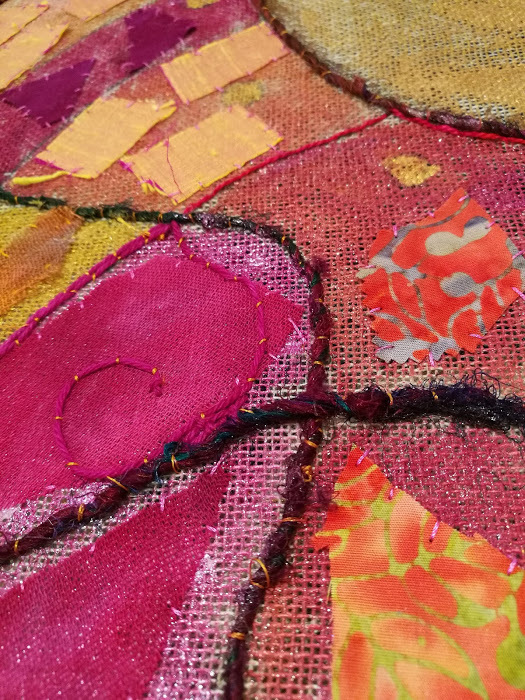 I began adding running stitch to sections of the piece, these somehow give it movement and hold everything together. And then I decided (possibly rashly), that the circles would include some tent stitch. 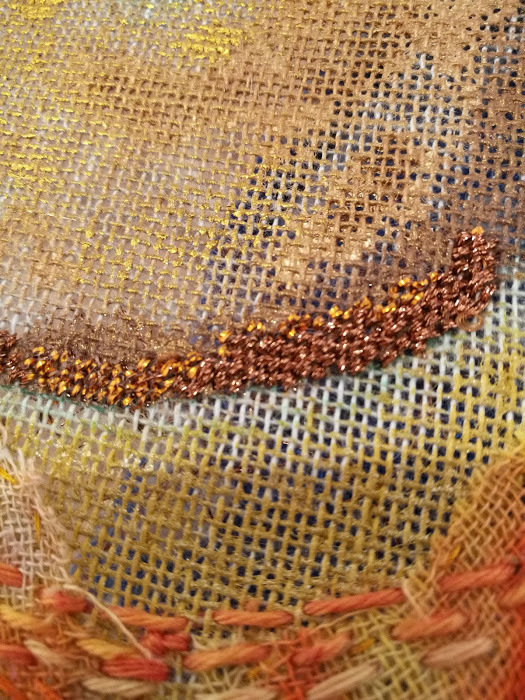 Here I'm using a DMC metallic thread which has the thickness I needed. You can see a little more of the development in the three pictures above. Still a long way to go but I'm over the initial feeling of marginal overwhelm and now it's beginning to feel exciting. I'm still posting updates to Instagram Stories on the days when I make progress with this piece, so if you follow me there you'll see it coming together. The dry, hot weather has parched the countryside, bleaching the fields where the only green is random patches of docks. The thistles haven’t appeared this year. 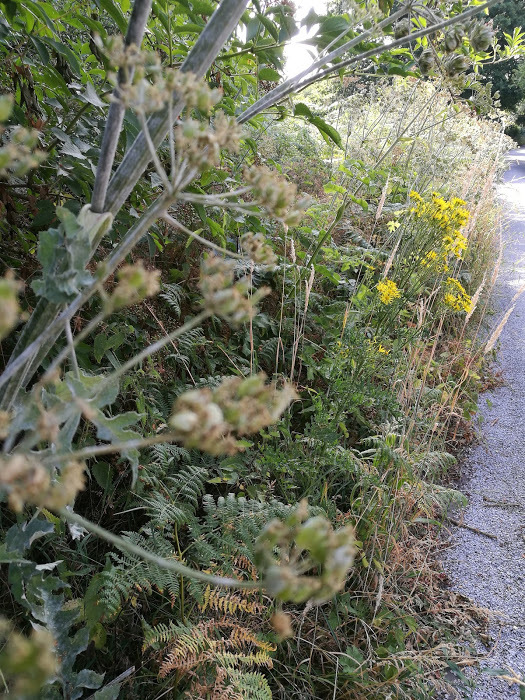 The few surviving nettles that line the lane and usually trim it in green are all brown and limp. Everything looks tired - in fact it looks like late August, which is how it’s been feeling. There are sloes on the blackthorn and crabapples beginning to drop into the lane. No blackberries for us yet, but on Twitter I’ve seen people picking them - too soon, I’m not ready for the onset of autumn, and that’s what blackberry picking is for me. It’s good to be back. I’ll be picking up the reins again now. I may even put together the occasional gallery from my travels…(only 2058 photos to process...x).